Taglines: The first casualty of war is innocence. 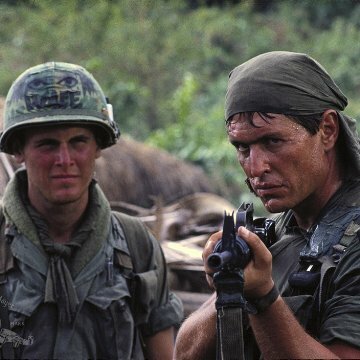 According to Oliver Stone, he intentionally cast Tom Berenger and Willem Dafoe against type (Berenger, who played the ruthless, sadistic Sgt. 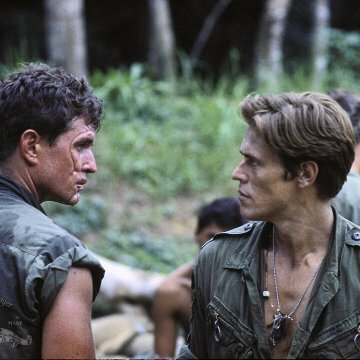 Barnes, was mostly famous at that point for playing good guys, while Dafoe, who had primarily played villains up until then, played the heroic, compassionate Sgt. Elias). The casting worked, and both men received Oscar nominations for their work. Continuity: When leaving the burning village, SSG. Barnes' left eye is black. When he and Sgt. Elias return to base camp and have a discussion with the Captain, Barnes' right eye is black. Pvt. Gardner: [seeing body bags] Aw, man, is that what I think it is? Sergeant: All right, you cheese-dicks, welcome to the 'nam! Follow me. Its hard to know where to start with such a breathtaking film. Oliver Stone's Platoon is quite simply the best Vietnam war film ever made in my opinion. Everything about it is as close to perfection as we are likely to see. 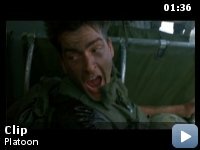 Charlie Sheen plays the lead, and Willem Defoe and Tom Berenger play the two sergeants that form a key part of the plot. Chris Taylor (Sheen) is torn between the sergeants. 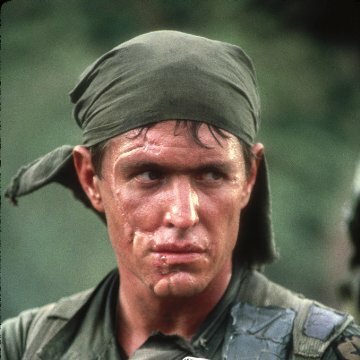 Barnes (Berenger) is the battle hardened, brutal murderer, who uses the war as an excuse to tender to his sadistic pleasures. Elias (Defoe) is the other side of the spectrum. We get the sense that he has wrestled with his inner demons, but he has successfully come through to the other side. He has compassion for his fellow man, and he uses drugs as a form of escapism from this brutal war. The two symbolise the struggle that Taylor must face if he is to survive out in Vietnam. 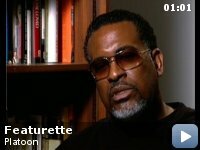 Oliver Stone perfectly captures war. The shooting is frantic and impossible to follow. It perfectly disorientates us, just as the soldiers were. We have no idea who is being shot at, and neither do they. We follow the war at ground level, and see the brutalities first hand. 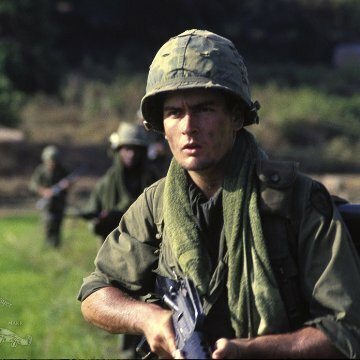 Having served in Vietnam, the film is loosely based on Stone's time out there, and Taylor loosely based on himself. 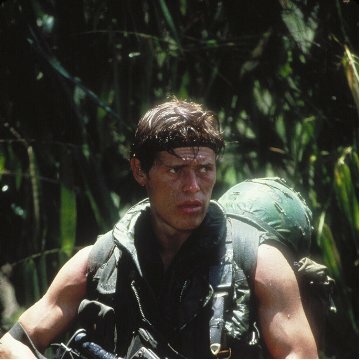 Full Metal Jacket showcases how inhumane the war was, Apocalypse Now turns it into a story about life in general, and hopelessness, but Platoon has everything. Trying hard to avoid the old cliché, but if you only watch one war film, make sure it is this one. Nothing else can come close.